Hello, Princesses! 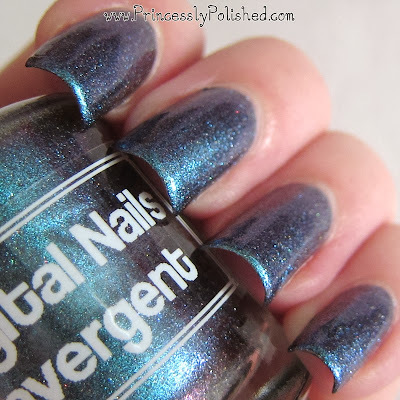 Today I'm sharing an absolutely gorgeous indie creation - Convergent by Digital Nails. This polish is also extra-special because it was the first manicure I got to do after giving birth to my daughter (she was almost 2 weeks old! ), and it felt so great to do my nails again. The only bad thing about this polish... it's so beautiful and color-shifty that I spent almost an hour trying to choose which pictures to share. I got it down to 12. Duochrome and multichrome polishes are wonderful to wear during the less-than-sunny months because they come to life in lower lighting. Convergent did not disappoint. 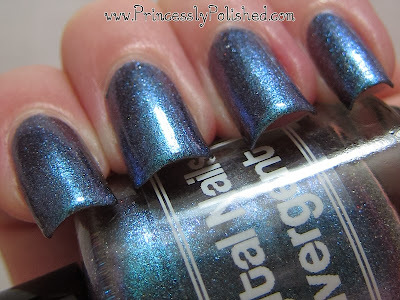 This foil-metallic polish shifts through deep purple, sapphire blue, deep teal, and aqua. In some dim lighting it even showed as a beautiful emerald green! You may notice pale green at the far end of the purple shift, as well - it likes to hide, but it's there. As an added bonus there is holographic microglitter to give you a delicate rainbow sparkle. Underwater with direct lighting. Sparkles! Are you drooling yet? Not very ladylike, but totally understandable! Dries: Quite quickly, and to a satin-y finish. I used shiny topcoat, as usual. Coverage: Surprisingly perfect. (I got this out and thought "Rochelle, you should be layering this over a black base." Typically polishes like this are sheer and need a dark base to pop. But I didn't go grab a black creme, and carried on.) First coat: sheer. Two coats: boom! opacity. I was amazed. These pigments are floating in a charcoal jelly, which has amazing depth and coverage at two coats, all the way to the tips of my nails. Formula & Application: The formula is great. Notice how I gouged my pinky nail? Foil polishes show every little ding, yet this one healed pretty well once I added topcoat. Convergent is also easy to apply and doesn't drag or create bald spots! Wear time: Uhhh... honestly, it's been two months! It wore well, from what I recall. Removal: Easy to take off, but you will end up with little shimmer particles stuck to your skin. Overall: I love it! I can't believe I almost passed on grabbing it. Perfect for: The mermaid princess that longs to get back to the deep sea. Also: foil-metallic lovers, multichrome lovers, and pretty much anyone who can appreciate a good jewel-tone! Where to Buy: Digital Nails etsy shop. So yes, I would definitely recommend this polish. I don't see it in stock currently, so you may want to try asking Raphaelle if she can hook you up with a bottle - she's a dream to work with! Take care until next time!